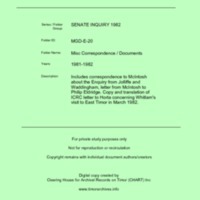 Includes correspondence to McIntosh about the Enquiry from Jolliffe and Waddingham, letter from McIntosh to Philip Eldridge. Copy and translation of ICRC letter to Horta concerning Whitlam's visit to East Timor in March 1982. “Misc Correspondence / Documents [MGD E20],” CHART DIGITAL, accessed April 18, 2019, http://chart-digital.info/items/show/671.